The Staple Hill Beacon Tree is one of the few examples that exist only in the form of pure energy. In the image you can just make out the concrete trig point which marks the current highest point on the northern escarpment of the Blackdown Hills. This was not the highest point as three metres to the west there was an oak on higher ground. In the image you should be able to see a ring of stones that mark the footprint of the tree. The 772 year old oak was cut down 195 years ago in 1821AD so its timber could be used for shipbuilding. 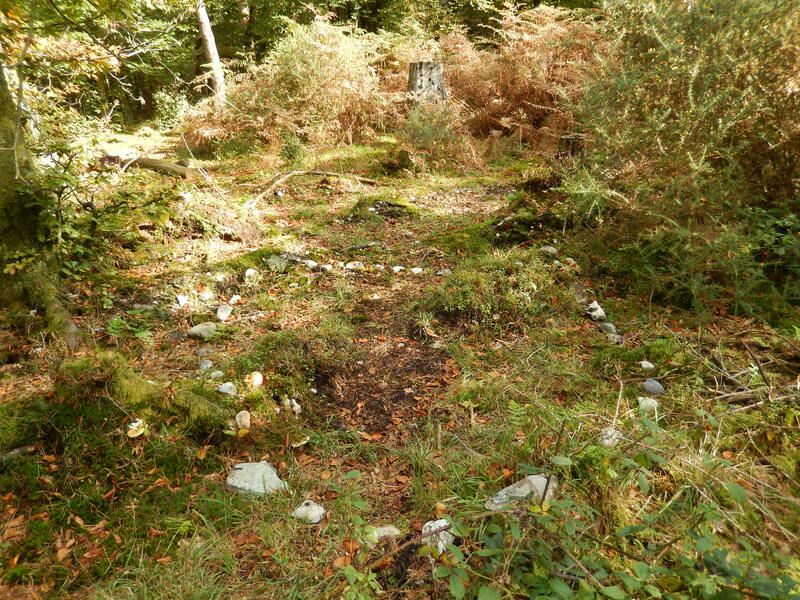 Over time its roots rotted away and the area was cleared around it for farming land, followed by forestry. Physical traces of the oak are long gone but its energy is still there and it has grown in scale over the last four years. It now has a vertical vortex of energy which is 36 heights above and below ground. A height is from the very top down to the bottom of its roots. When it was cut down it was 12.5 metres, top to root bottom, so the vortex is 450 metres above and below ground. Its lateral field is a giant bubble of energy up to three quarters of a mile in all directions. The energy has remained and grown as nine energy lines cross at this point. There is the three mile wide Dragon Line, a two mile wide River Line, a one mile wide line and six half mile wide lines. There have been male oaks on this site since 3585BC. The first oak germinated from an acorn stored and forgotten by a jay. The next six of the seven oaks on this site were generated by acorns produced by the oaks towards the end of their lives. All these six oaks were pollarded and harvested but in time they became a meeting place for the woodland peoples. The Beacon Tree has made it clear to me that everyone who quietly spends time within the ring of stones will benefit from its energies and insights. Beacon Trees have a secret name which I can only reveal to those who are chosen as their guardians. In this case it has told me that I can reveal its name to everyone. The Staple Hill Beacon Tree has the name of ‘Ty’. Seek him out and spend some time within his field of energy.